Before the debut of the FOR PRIM “trailer” on Wednesday morning, another Mockingjay Part 2 poster was released via Jennifer Lawrence’s Facebook page. Again we have the red Mockingjay outfit, which we still don’t believe will be in the actual film, but is merely for these in-universe propaganda promotional pieces. The red makes for a bolder visual statement, but as a practical matter, we see the use of the red as a way to differentiate the Mockingjay Part 1 and 2 marketing pieces. Thinking back to May when the first promotional items for Part 2 came out with the Sisters poster or just the Effie image, a common complaint was that it looked just like Mockingjay Part 1 stuff. By making the suit red, they’ve instantly been able to make things seem “new” without being really new while creating a sense of continuity between the two films. Having her standing in profile reminds us of the first character posters for the Hunger Games. Much has changed for Katniss, but much remains the same. The new element of this poster is the inclusion of a “real” mockingjay resting precariously on her shoulder (don’t fall off, little buddy!). Maybe he’s positioned like that because he’s about to fly away again – Mockingjays are busy creatures after all. We suppose it’s more interesting to have him with Katniss than just her by her lonesome, and he’s not sticking awkwardly out of her neck, so we’re grateful for that. This poster overall harkens back to Catching Fire’s “The Sun Persists in Rising” poster that had mixed reviews back in the day. As personal “confession,” I’m looking at the “Sun Persists” poster right now because I have it hanging in my living room. I know it gets criticism for a lot of reasons (the pose is too Pocahontas/Lion King/you name it) but I like it for three reasons: the tagline, the clouds, and overall color scheme. (The color scheme is PERFECT for my living room decor). “The sun persists in rising so I make myself stand,” is from the beginning of Catching Fire and fits with the overall look of the poster, and what Katniss has to do throughout the book/movie. It’s also nicely relevant to anyone’s life – you may go through great struggles in life but you have to continue on and face the days as they come. 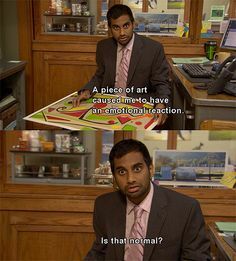 It’s a more “artistic” poster, and with all ART we all feel different things looking at it. This new poster is in the same LOOK GUYS, THIS IS ART category. It also has the same cloud motif and obscure book quote tagline. So sure, the clouds and colors are nice but that book quote is a WEIRD choice. Yes, we know it’s from the passage in Mockingjay after the parachute fire bombs go off. Real or not real? I am on fire. The balls of flame that erupted from the parachutes shot over the barricades, through the snowy air, and landed in the crowd. I was just turning away when one caught me, ran its tongue up the back of my body, and transformed me into something new. A creature as unquenchable as the sun. The only reason we can think of for including this quote is that it’s meant to be paired with the FOR PRIM trailer. The trailer is all about bringing you the #feels about the moment when Prim dies and Katniss’s devastation from that loss. How does that moment of Katniss becoming a “fire mutt” and subsequent limbo between life and death relate to this poster? We’re struggling with the choice. This is not the final poster though, just as FOR PRIM is not the final trailer. These are extras, so at least it’s something new to talk about. 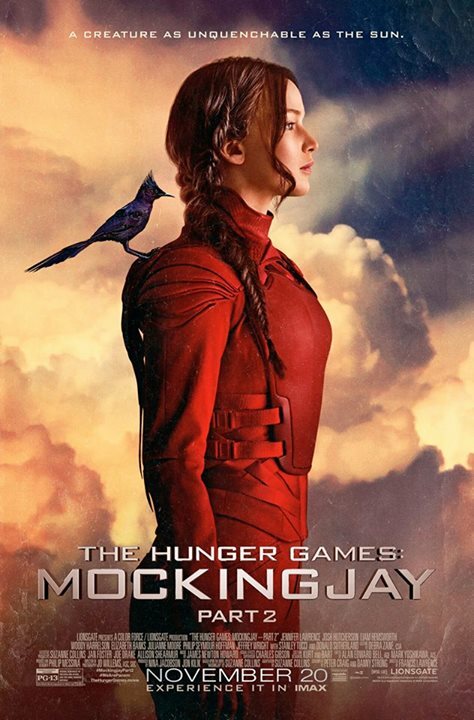 Wonder if this poster will be the cover of Tim Palen’s $850 ULTIMATE Hunger Games photography book?